I have a very beginning w.i.p. teaser pic, this was taken on Friday, I'm done now and will be sending on this Friday . This craft was SO fun to make because of the great subject matter, lightning! I REALLY like the necklace, the fibers you used and the little multi-faceted beads, it looked so "ocean organic"
I have an action shot that I was too shy to post before...lol...excuse my pasty complexion. The jingle anklet....I LOVE this! It hasn't left my fat little footie yet! Thanks so much! I have all the jewelry I need for this season! Kiwi-chickie sent an awesome package, I really loved the wonder woman card! Thanks so much Sorry for the delay in posting pics, my comp had some unexpected difficulties. I have 2 pairs of cupcake earrings, and a seaside scarf to send . The scarf is 100%wool, so anyone with allergy can't have it. 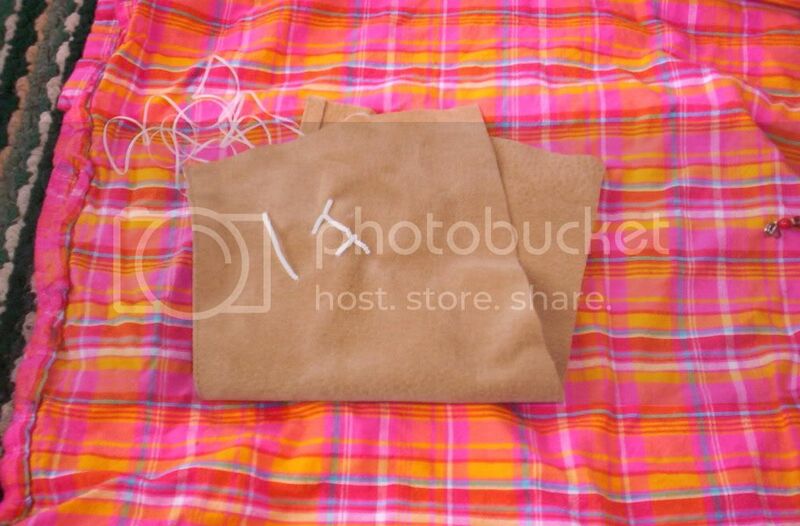 My 13 yr. old daughter found both of these fabrics at wal-mart for 2 bucks a meter in the bargain bin (I love that bin!) So I made this bag for her. I just love how the colors go together. had to make a matching d.s. pouch! It's really a nice scarf that I can wear all summer (and will) and I'm making some for my friends now, in all different kinds of yarn (it works better with thick yarn). It's perfect for a traveling project, easy to figure out where you left off . I love the way it ruffles and twists upon itself.